Greetings From the Gegnt (neighborhood) is a travel blog divulging the Yiddish Book Center’s Wexler Oral History Project’s adventures in Yiddishland and beyond. It is written by the fleet of Yiddish and video nerds scheming at Yiddish Book Center in Amherst, Massachusetts. Don’t know about the oral history project? 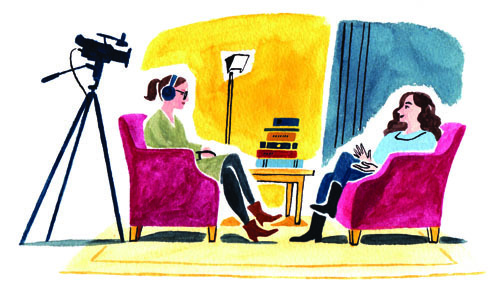 The Yiddish Book Center’s Wexler Oral History Project is a growing collection of in-depth video interviews. Through stories of tradition and survival, memories of bygone neighborhoods, foods and family rituals, and stories of connection to Yiddish language and culture today, we are chronicling the many ways there are to be Jewish. In the past four years, we’ve recorded over 400 interviews, stories told by people of all ages and backgrounds—bobes (grandmothers) and young activists, Yiddish language students and professors, musicians, and grandchildren of Yiddish writers, native speakers and non-Yiddish speakers. These interviews illustrate the ways in which Yiddish language and culture inform Jewish identity. Together, these stories and reflections provide a glimpse into the ways in which cultural heritage is transmitted, adapted, and reinterpreted by each generation. The goal of the Wexler Oral History Project is to record and preserve stories — your stories and those of your family and friends. We invite you to tell us your story. We are particularly looking for people with strong connections to Yiddish language and culture. However, we also interview people from all ages and backgrounds in order to explore the broadest expression of Jewish experience. Your story can truly become part of history. Zay azoy gut, please let us know if you or someone you know would like to be interviewed. Not every Jewish story ends up in a book. Want to know who’s using our collection?